Our new Deck Table is bigger (and better, of course) than our Director's Table. 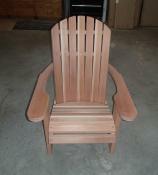 Our redwood collection is elegant, luxurious and simply beautiful. Table? Chair? Both! It's a table for two. This is a cozy chair for two -- with a table in between to separate "your space" from "my space." Prop your tired feet up on one of these footrests. 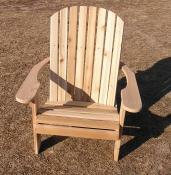 They're great additions to any of our Adirondack chairs. 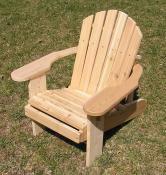 This chair is just the right size for growing children and young adults. 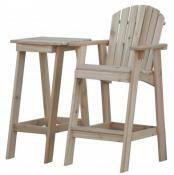 These four chairs fold for easy carrying and convenient storage. All four feature stainless steel hardware. 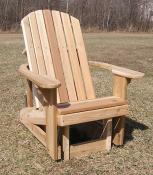 This coffee table -- a perfect companion to any of our chairs and gliders -- measures 20" x 40" and stands 18" tall. The Trestle Picnic Table measures 33" x 70" and stands 30" tall -- plenty of room to sit three or four people on each side. 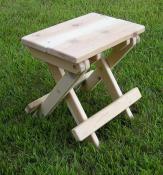 This lightweight stool easily folds up -- it has its own built-in handle. 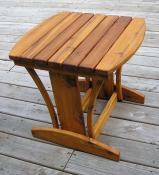 This custom-built redwood table measures 39 1/2" x 72" and stands 32" high. 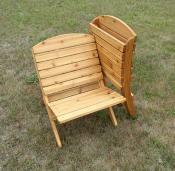 Each bench measures 11" x 36" and stands 20" high.